Nada Kita by Tuned Global, amongst the "Leading Free Music Streaming Platforms In Asia 2018"
Nada Kita is a music app available in Indonesia, owned by Tuned Global and launched in 2016. Two years later, with 2.3 Million installs it is listed as a leading streaming service in Asia, alongside Spotify, Joox and KKbox. Read the article below, written by Monica Tong and initially published in Music News Asia. While most of you may already be using a music platform somehow or rather (via an app on your smartphone or on your PC or Apple computer), there are still some uncertainty to what may be more readily accessible in Asia. While Google Play and Amazon Music may not be available to some markets in Asia, there’s definitely more than enough of tracks for a single individual to enjoy for the next hundred years to come – and that’s if we want to put a figure to it. Here’s our top pick for 2018 and are specifically chosen according to their modest yet impressive selection (yes, we are talking about the different languages and the diverse selection we have in Asia). 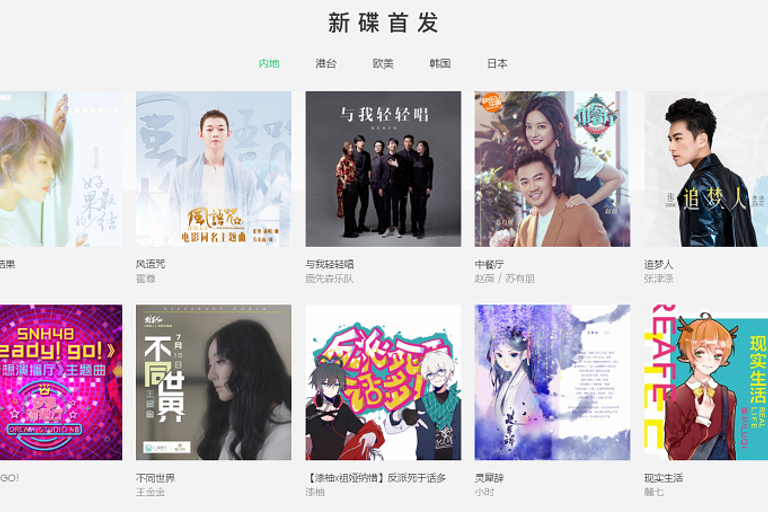 Following its success with QQ Music on the mainland, Chinese internet titan Tencent Holdings has quickly established a strong position in key Asian markets with almost 50 million downloads since it launched in 2015, accounting for more than 50% of all music-streaming app downloads in Malaysia, Thailand, Hong Kong and Indonesia. With curation tailored specifically for the Asian market, Joox offers a wider selection of local and regional content such as K-pop, than its Western counterparts. Thumbs up to its developer for allowing users to import downloaded songs and songs from iTunes to Joox, and sorted according to Track, Artist and Album. For those who love dozing off to your favourites tunes, the sleep timer feature gives Joox-sters the satisfaction of falling asleep without tuning-off for the day. A simple ‘tap & drag’ function makes it all much easier to create and organise songs in ‘My Playlist’. Saving up on data? With Joox, you can determine how large the internet data that’s available to you before you are recommended a song for listening or downloading. For those avid electronic music fans out there, DI.FM is a multi-channel internet radio that focuses exclusively on Electronic Music. Steve Aoki and many international Djs out there began their musical career by initially distributing their music at DI.FM. Founded by Ari Shohat, the platform was awarded Best Global Radio Station at the International Dance Music Awards in 2010 and nominated Best Overall Online Radio Service in 2014 by RAIN Awards. Its sister networks – RadioTunes, JAZZRADIO, ROCKRADIO, and ClassicalRadio streams non-electronic dance music genres including pop hits, jazz and rock across 300 channels. Electronic music has been on the rise in Asia and who knows, you may just be listening to another rising star on DI.FM right now. With over 40 million tracks to choose from, KKBox has garnered the support of over 500 international major and local independent music labels making it one of the most comprehensive Asia-Pop music library currently available in Taiwan, Hong Kong, Japan, Malaysia, and Singapore, accounting for 50% of the worldwide downloads. KKBox is the only music streaming site that has been running its very own music awards for over a decade today. Alongside the karaoke feature (lyrics included), it has also launched KKTIX online ticketing and KKBox Live concert streaming in 2014. Over the years, it has received investment from HTC, Japanese telecom giant KDDI and GIC, Singapore’s sovereign wealth fund. Its 13 years of ‘big data’ consists of 50 billion play counts makes KKBox one of our top choices. Its latest feature is a collaboration with audio recognition company ACRCloud to launch a new KKBox built-in feature “music recognition” that provides two different identification methods: listening to the source of “music recognition” or the user can hum directly into the “humming identification”. Spotify is yet another popular free online music streaming site that has a good collection of more than 20 million songs for online listening from all popular genres and artist. Asia’s choice of music is vast considering its fragmented demographics and while Spotify is still the preferred choice for countries like Singapore and Malaysia, there’s also a growing popularity from Japanese and Korean users recently. While the total songs available is impressive, users in Korea and Japan have only started using Spotify for its easy access to western music. Music streaming in Korea started as early as 2008 and their very own streaming platforms have extensive list of only Korean songs with limited English choices. Nada Kita is a smart music streaming app available only Indonesia. It allows Indonesians to easily listen to their favourite local music for free without using a lot of mobile data. Offering over 150 mixes of various moods, activity and genre, the app is curated by local music experts and has attracted over 2.2 million Indonesia users since it launched 2 years ago. The app is created by Tuned Global, a mobile engagement company and has partnered with major Indonesia’s music labels, including Aquarius Musikindo, Musica Studios, My Music, Nagaswara, Trinity and VMC to include traditional genres such as Dangdut, Melayu, Pop Koplo or Dancedhut. Users can earn Nada Kita Plus, a free upgrade version that allows listeners to play their favourite tracks without using their mobile data. While Naver, Kakao and Melon may never be available outside of their respective country, their users are definitely force that we all need to reckon with. With almost 150 million users combined, garnered users through its messaging app. While users may be able to share music with their using their messaging app, these features managed to provide a healthy growth to the music app specially created for its users. While this may not be a popular strategy, it has been adopted by a few others including Raku and Yonder Music, operated by Astro Sdn Bhd and Celcom respectively. If you have another platform that you really enjoy using, we’ll be happy to hear from you and why you’ve made it your preferred choice. Just go for one. Any one platform will give you more than a decade of listening, so start now!